Paramount recalls Saving Private Ryan Blu-ray disc | What Hi-Fi? Users of certain Blu-ray players (including models from Panasonic and Sony) reported severe audio sync issues from chapter 15 of the film onwards. As a result, Amazon temporarily stopped selling the title. "Although Technicolor employs comprehensive quality control measures, in this instance the issue was not detected prior to replication." says Paramount. "Our Sapphire Series was created to present our greatest films in the finest picture and sound quality available," says Dennis Maguire, president, Paramount Pictures Home Entertainment Worldwide. 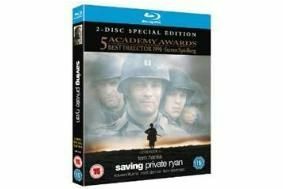 "Saving Private Ryan is a five-time Academy Award-winning film so we are recalling this edition to ensure every Blu-ray disc honours Steven Spielberg's vision." Anyone who has bought the disc in the UK should ring 08000 852 613 or return the disc to the store where they bought it to receive a replacement free of charge. Technicolor expects to have replacement discs available at retail no later than Tuesday, May 18th.